Tim Harris’ book offers a detailed and multifaceted account of the reigns of the Stuart monarchs, James I (also James VI of Scotland), and his ill-fated son, Charles I. For anyone who isn’t familiar with this period of history, James VI of Scotland came to the throne of England and Ireland as James I following the death of Queen Elizabeth I in 1603. As the son of Mary Queen of Scots and the great great grandson of Henry VII, the first Tudor King, he was in line to inherit the throne of England and Ireland, as well as that of his native Scotland. The period of his reign is referred to as the Jacobean era. It saw the continuance of the so-called golden age of Elizabethan drama with writers like William Shakespeare and Ben Jonson contributing to a thriving literary culture, as well as some major political events, such as the gunpowder plot of 1605. His son, Charles I, came to power after his death, ruling from 1625 until the events of the English civil war(s), in which the King fought the armies of the English and Scottish Parliaments in the years 1642-46 and 1648, which led to his execution in 1649. Why did it prove impossible to hold this multiple-kingdom inheritance together? Was this inheritance unmanageable, or inherently unstable, meaning that some sort of major cataclysm was bound to eventually come? Or were the problems that arose due to the failings of the particular men in charge? In the second of these preparatory chapters, ‘How to Reigne Well,’ Harris examines the contemporary ideas and ideals of kingship, including those held by James I himself. He presents sovereignty as a fluid and ambiguous concept that was often manipulated to the purposes of the moment. Relations of power between the king, the law, and the religious ideals of the country were never defined absolutely. This left a lot of room for political and polemical manoeuvre. The king was both a ruler and lawmaker by divine right and subject to the law and to the needs of his people. Where emphasis was placed would vary depending on the writer or orator, and the occasion. James I himself took each of these stances at varying points, depending on how he wished to be seen at that moment; a strong king invoking his divine right, or a beneficent ruler, servant of his people. This section is useful in contextualising the events that were to occur during the English Civil War, and the arguments that were made on either side of the decision to execute King Charles I; a decision towards which the narrative of this book is inevitably building. The main body of the book is an in-depth study of the individual reigns of James I and Charles I. It deals with the impact they had in all of the countries over which they reigned, as well as the circumstances that challenged their ability to reign. This book is particularly good in that the discussion of Scottish and Irish issues reaches beyond a simple overview of how the situations there affected things in England. Harris leads us through key events; the gunpowder plot, religious division, various rebellions, while opening up a range of interpretive possibilities and probabilities in a way that encourages engagement. Harris helpfully situates his scholarship within the debate around the origins of the English Civil War. The general understanding of events falls roughly between a traditional argument based on the notion of long-term social and economic problems, and a revisionist argument which emphasises the significant differences of political and religious belief between the king and his parliament, and suggests that chance and fortune played their part in the way events unfolded. Harris’s position tends towards restating the traditionalist arguments against the revisionist ones. He concludes that while the war was certainly precipitated by short-term factors as the revisionists have suggested, these only became important due to “the longer-term political, religious, social, economic and cultural contexts, which, even if they do not possess strong causal significance, certainly possess great explanatory significance.” It is these longer-term conditions that Harris’ book, as a whole, investigates. 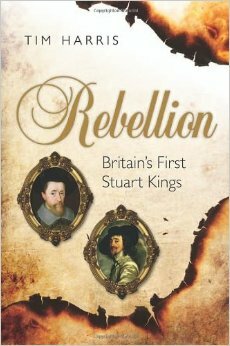 Rebellion offers fascinating insights into two significant historical figures and the various challenges they faced during their time on the throne. Harris focuses on the big political, religious, and economic themes that underpinned the mood of the times, fostering a number of rebellions across the nations of the British Isles. Capturing the tumult and division of the early Stuart years, Harris offers a steady and reasoned analysis of the underlying conditions of this discord, which makes essential reading for anyone interested in the period.